Are you ready for Ivy Pocket? The wickedly funny, completely unreliable maid of no importance returns—this time as a coffin maker’s daughter—in this action-packed sequel to Anyone but Ivy Pocket. School Library Journal says, “Fans of . 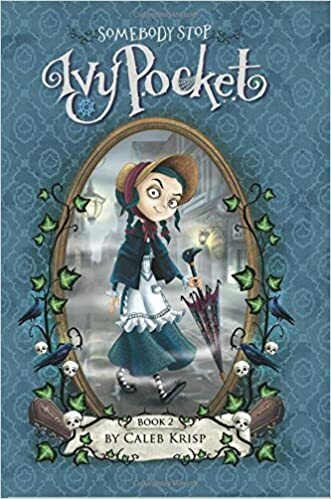 . . Lemony Snicket’s A Series of Unfortunate Events will love Ivy Pocket’s zany adventures.” Featuring extensive black-and-white interior art by Barbara Cantini throughout. Everyone seems to want a piece of Ivy Pocket. Her adoptive parents keep trying to get her to clean the funeral home, even though Ivy’s certain she’s already the picture of a perfect daughter. A beautiful heiress named Estelle wants Ivy to uncover the dark truth behind her brother’s death. Her new friend, Miss Carnage, keeps asking Ivy the most curious questions (the poor, clueless dear). To top it all off, Ivy must protect the Clock Diamond from the evil Miss Always, who seems to be lurking around every corner! A fast-paced and hilarious follow-up to Anyone but Ivy Pocket, which Booklist praised as “a droll chapter book with a Victorian setting and a one-of-a-kind protagonist.” This is the second of three books about Ivy Pocket!